Using Bulk actions, one can perform mass re-assignment of the tickets assigned to Agent A to Agent B. Learn more about bulk editing here. In the ticket list page do a filter based on Assignee to filter all the tickets belonging to the agent whose tickets needs to be assigned. 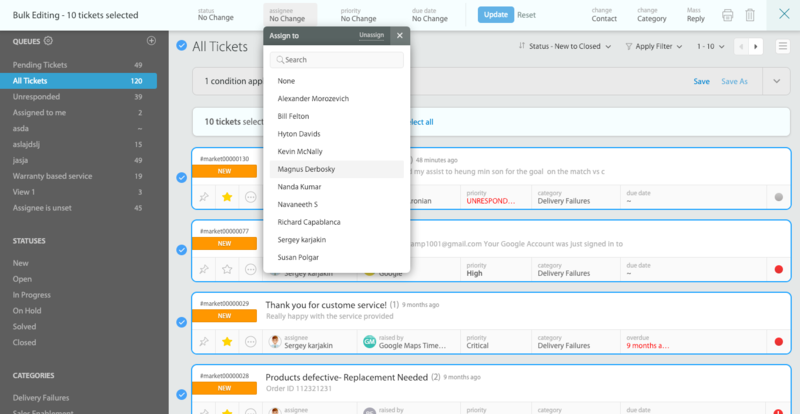 You can also do a custom filter/queue to select a subset of the tickets. Select the displayed tickets that you want to reassign, click "Assignee" and choose the appropriate agent name. Click "Update" to confirm the bulk ticket assignment.